Currently set for 63mm lug caps. Manufacturer rated for 27mm through 110mm closure size range, with proper change parts; -- CALL 315-589-4511 to to discuss your particular steam capper / vacuum capping requirements. 9 foot 6 inch long thru-conveyor, with 4.5 inch wide stainless steel tabletop chain, at a 35 inch working height. Left to right product flow from operator control posiiton. Model 6R17 cap sorter with hinged cover, 83 inch high cap infeed. Stainless steel control panel w/operator controls. High speed model for up to 250 fpm conveyor speed. 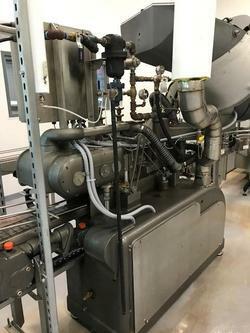 Manufacturer literature rate up to 700 caps per minute depending on cap and hopper setup. 60 psi / 350-400 lbs/hr steam required. 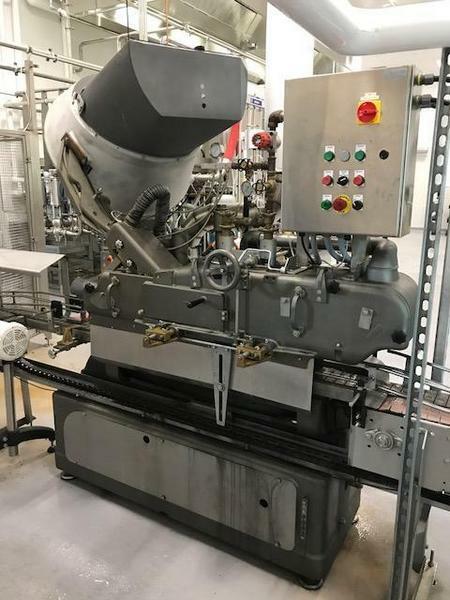 As of this writing, this vacuum steam capping machine is in stock at Alard in excellent condition, available for timely shipment. CALL 315-589-4511 to confirm availability, and to discuss your particular container closure / vacuum capping needs. ~ 2 inch front center inlet, top outlet, with sanitary thread connections. ~ Mixer and motor mounted on stainless steel base plate with stainlesss steel legs. 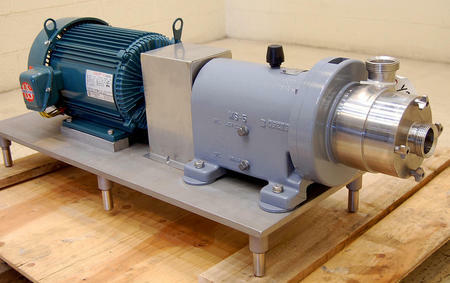 ~ 10 HP 208/230/460 volt 3 phase direct drive 3,500 RPM motor. ~ Corrosion resistant 316 type stainless steel pump-mixer head construction. ~ Food grade, pharmaceutical grade construction, with manufacturer tag stamped for USDA 3A dairy sanitary standards. ~ Manufacturer rated for up to 150 psi, 300 degrees Fahrenheit, and 30 gallons per minute, in "on-line", continuous shearing and mixing applications. blend, reconstitute, suspend, disperse, or polish. CALL 315-589-4511 to discuss your high shear mixing application. As of this writing, this hi-shear inline blender is in stock at Alard, in LIKE NEW condition, available for immediate shipment. 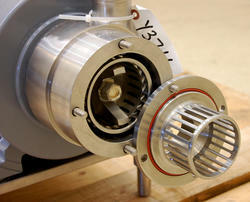 CALL 315-589-4511 to confirm availability, and to discuss your blending equipment needs.